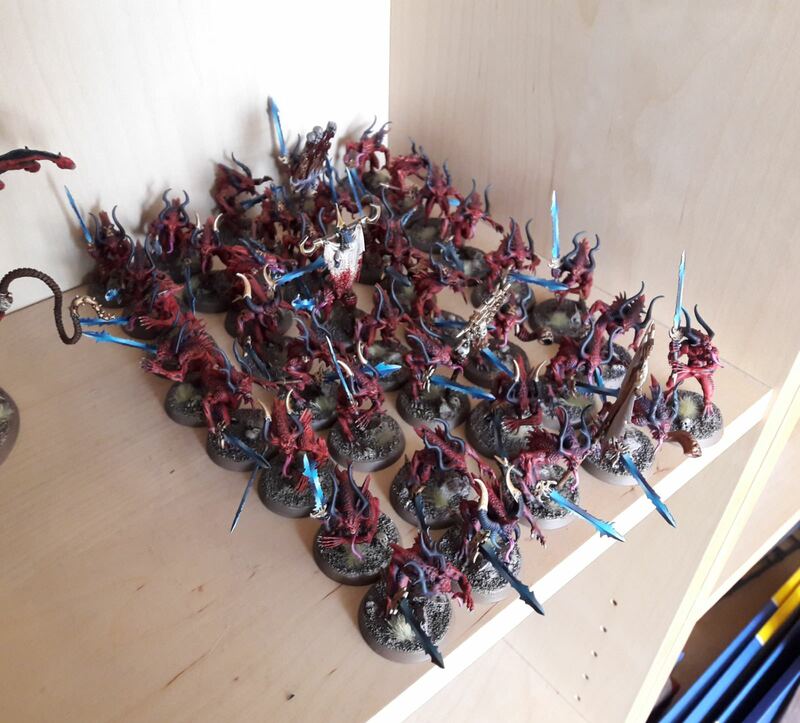 The Bloodletters are looking great! Nice to hear we'll get to see some more death guard soon! Bloodletters done! And these are also the first miniatures I painted for myself in over 7 months! Thanks for looking! I have a building session planned for tobight, with my local hobby buddy Ruben. Excited to finally, finally start the Death Guard! @ Pearson73: Cheers, buddy! They were awesome to paint, for sure! - Yes, sometimes I shade after the basecoat - it means just spraying the paint upwards into the nooks and crannies of the miniature, like the armpits or in their crotch. 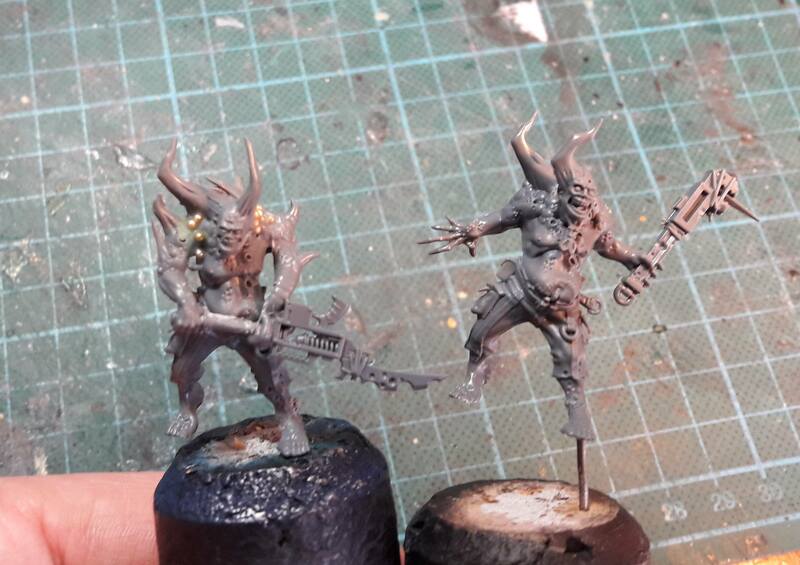 (Now that I think about it, I literally sprayed brown pain in miniatures crotches...). Another example of 'after-base-shading' is when I spray Rhinox Hide along the edges on the red basecoat of my Khornate armour. -Yes, I always keep heads seperate, even when they're helmeted. Heads usually have quite intricate detail, like eye(slit)s, and they deserve all the room and attention theycan get. It's far easier to paint in sub-assemblies. I almost never completely build my miniatures before I start painting. 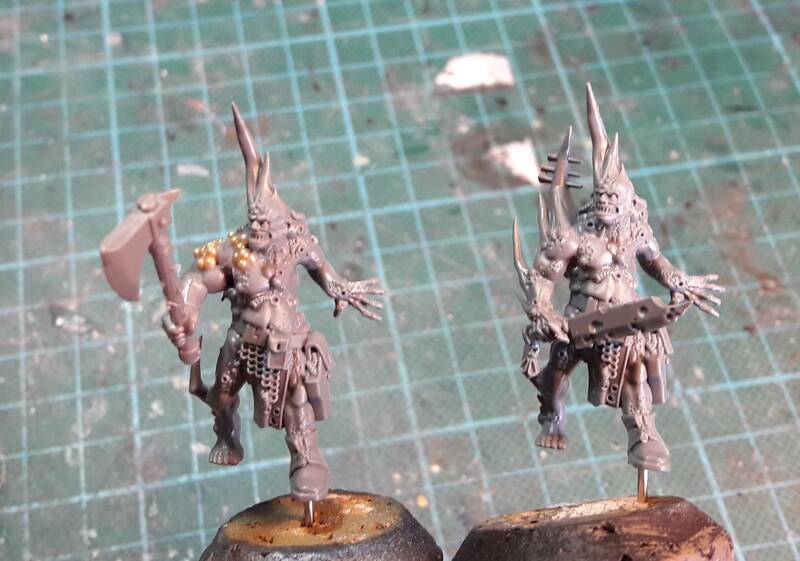 It also makes it easier to prime the bare heads white, while the rest of the miniature is primed black. @ Brother Heinrich: Aww! Thanks, buddy! @ Vairocanum: Woop woop! Keep yourself posted! Edited by Augustus b'Raass, 14 March 2018 - 08:32 AM. Bloodletters are looking good, bud. I agree with kizz, commendable airbrushing skills indeed! Much better than I could ever do, the most experience I had was with that garbage GW flamer-looking airbrush and it died after two attempts. Airbrushes are too much maintenance for me, but some of you have really mastered the craft. @ DuskRaider: That GW 'airbrush' wasn't an airbrush. I think people have had better results just putting paint in their mouths and going 'PFFFFFFRRRFFFFRFRFFFFFFSSSSfffssstt' over their miniatures than by using that thing. Airbrush maintenance isn't more work than normal brush maintenance - and it saves a ton of time. Those ten bloodletter swords took me twenty minutes to do - including the masking tape. Edited by Augustus b'Raass, 14 March 2018 - 08:52 AM. 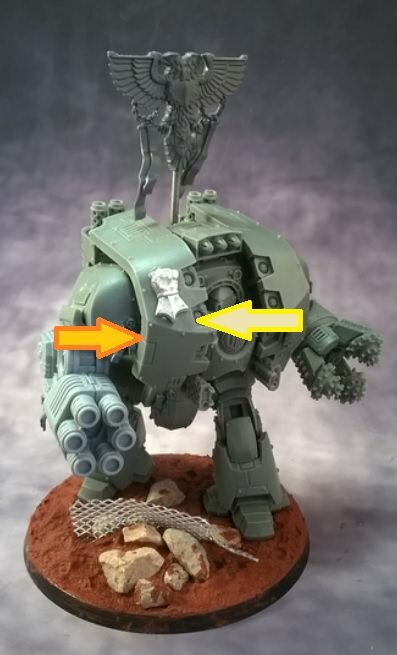 "@ DuskRaider: That GW 'airbrush' wasn't an airbrush. 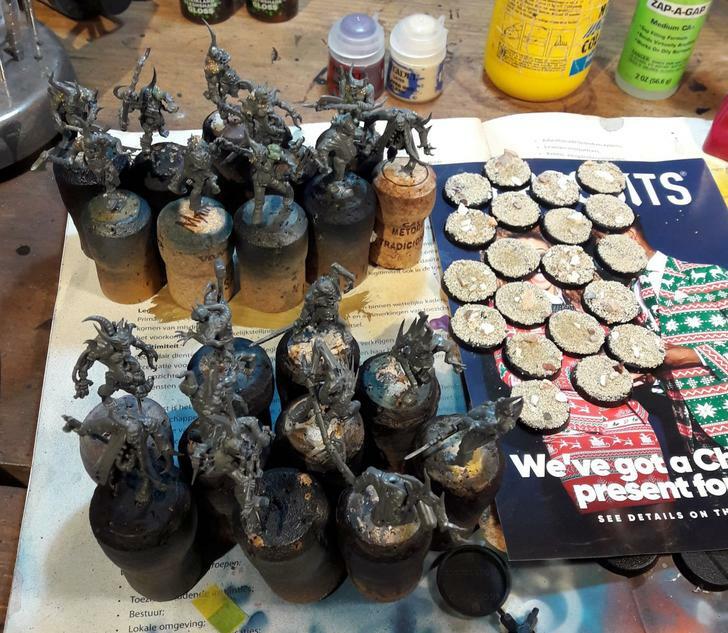 I think people have had better results just putting paint in their mouths and going 'PFFFFFFRRRFFFFRFRFFFFFFSSSSfffssstt' over their miniatures than by using that thing." I find stuffing a leaf of fresh basil between my teeth and gums helps get the taste of paint out of my mouth. The Night Lords are stunning and those Khorney guys are top notch! I'll second the thing on airbrush maintenance. While I don't use mine on Warhammer, I've had the same airbrush for 20 years (iwata eclipse) and its all about taking care of it, though standard brushes usually won't last THAT long. But, if you have a good set up, running paint through it really doesn't take long at all. Respirators are always a good idea( or you get wierd colored boogers).... especially if you can do a decent Bane or Darth Vader impression while you paint. CHECK OUT Da Rednekkz Hobby Blog HERE!!! 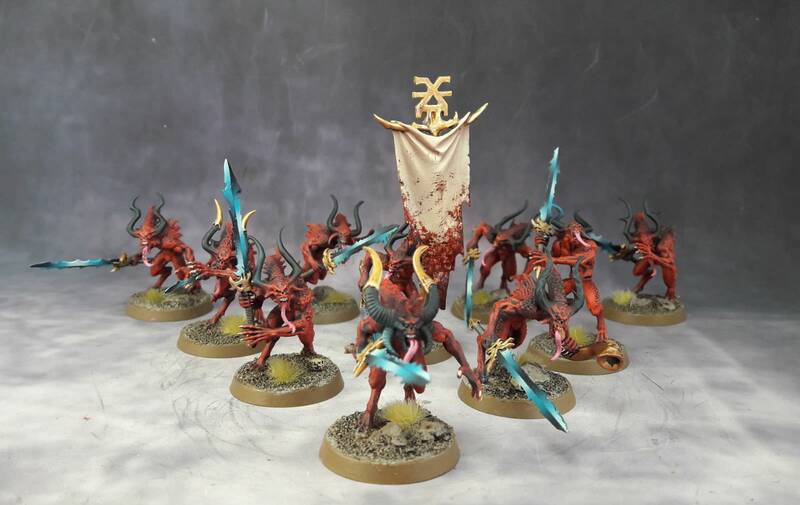 Bloodletters look great and looking forward to your Death Guard. This makes so much sense! I was thinking you may have some strange techniques that were passed to you in a dream that no one else uses, but it's 'just' clever airbrushing. 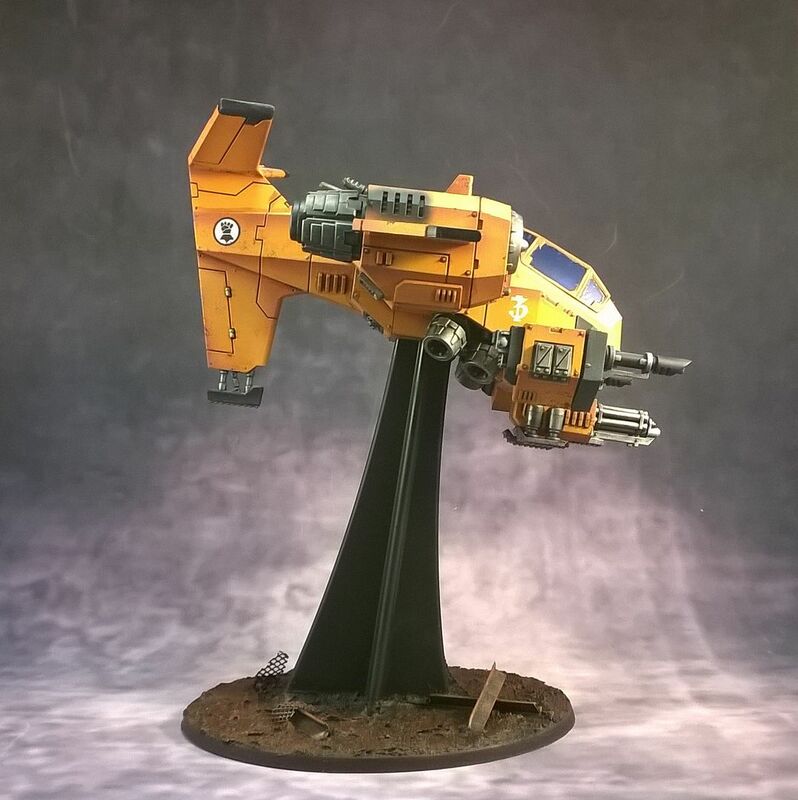 I love the idea of a post-base zenithal shade for some models. 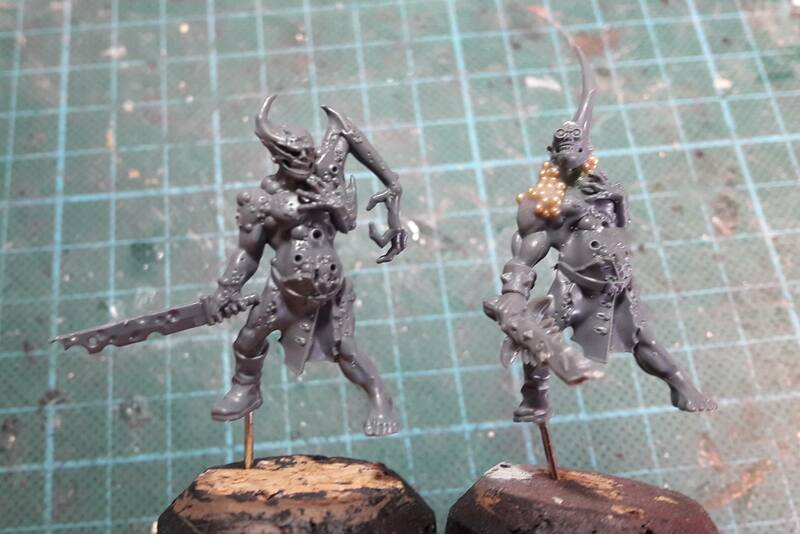 Is the Rhinox Hide along the edge of your Khorne armour just a base shade for the gold? You described your 'straight edge dividing highlight'. Can you give me an example of when you would paint a vehicle straight edge with a different tone on each whole panel? I tend to paint each panel more individually with an overall shade covering the bottom 1/3 of the vehicle. As I type this, I'm going to guess it could be underneath wings of flyers? In your airbrush cleaning bucket, how much of it do you submerge? Just the paint pot? Alright! One night of building and I have my very first five Death Guard build and primed in sub-assemblies! There's even two conversions in there. I changed the standard champion by replacing his power fist arm with a bolter arm from one of the bolter guys, and giving that other guy a plasmagun instead. Pretty simple, really, but I have to start anew. It's been eight months since my last power armoured dude! Woooooo! I also did twenty poxwalkers - ten standard and then ten more, all converted by changing their arms, heads, and sometimes adding some chaos marauders bits. -No, the GW Rhinox Hide is actually the perfect shade colour for FW Word Bearers Red, which is what It's for in this particualr recipe. - Here's an example. See the differences in the hue of the bare resin of the lower armour panel on the right (your left) chest armour panel of this Leviathan? - Just the paint pot, yes. I rinse it underwater with an old brush, and then open the valve so that I spray a little water through underwater. Edited by Augustus b'Raass, 15 March 2018 - 09:21 PM. 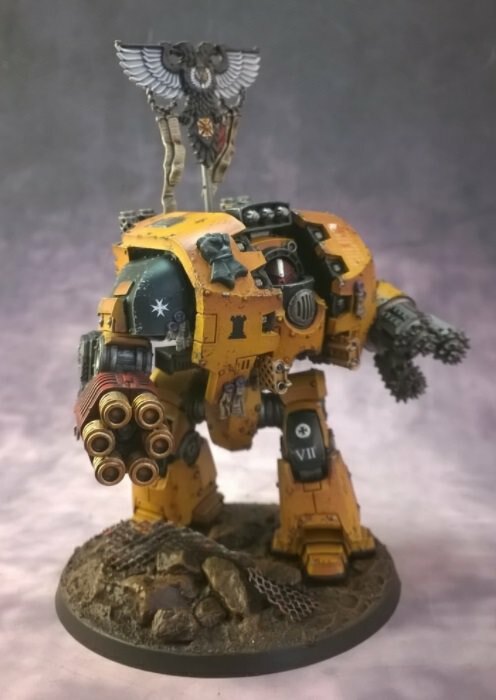 Good job on the Imperial Fists Leviathan and Stormtalon. Ohhhh boy! Here come the foot sloggers! Such a clear and exemplified answer about your airbrush highlighting, I can so easily see it! Makes perfect sense, I think it would require some practice for me though. Thanks for the cleaning bucket answer too! I'm working on some Death Guard at the moment, so can't wait to see yours. 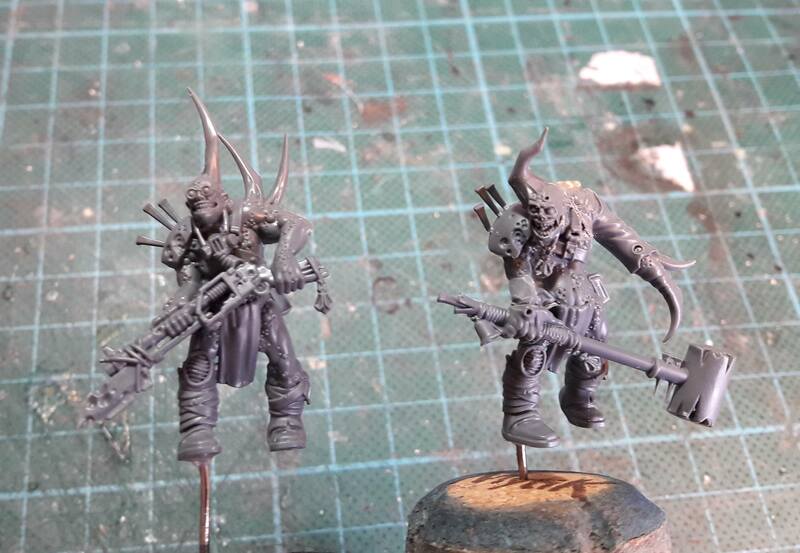 I've got my second squad of 15 Poxwalkers on the go at the moment, they are proving a little more painstaking than I'd like. Awesome bloodletters. Those swords are just killers! Looking forward to your deathguard. I just finished a unit of the new termies and they were a real pleasure to paint. Looking forward to your color scheme. Any ideas yet? 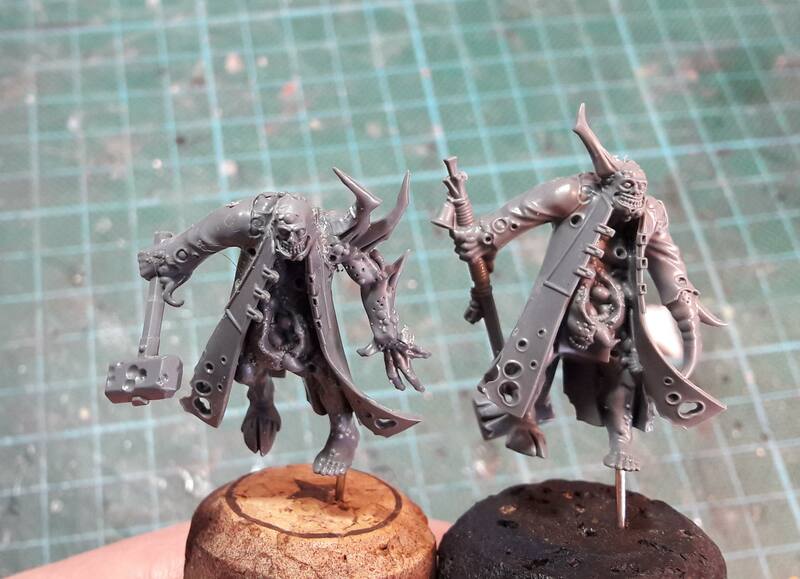 A point about poxwalker conversions. 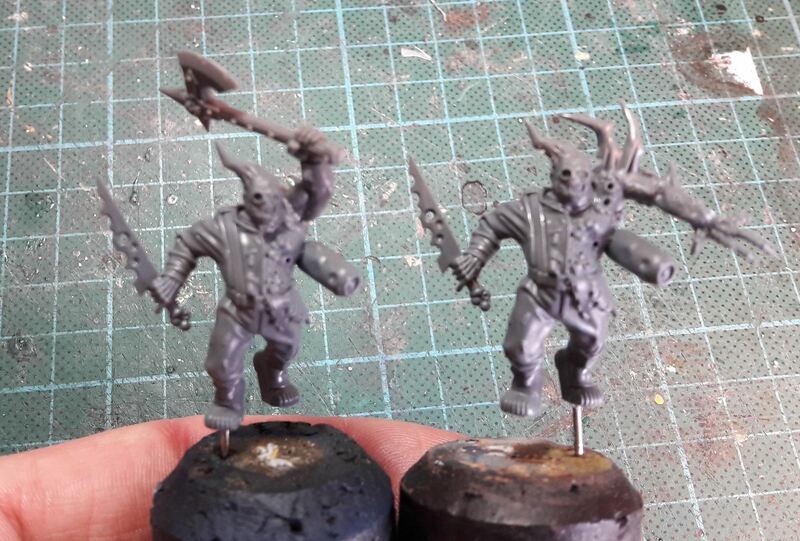 There's only 15 or 16 different poxwalkers miniatures, while no-one wants to have duplicates, and you need about 60 of them to create a decent horde. 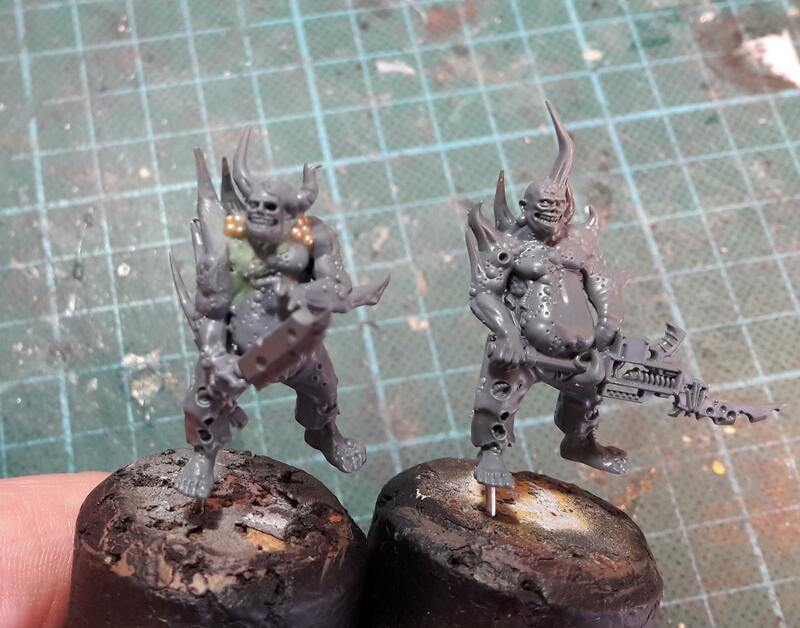 Yet because of their nurglite nature, they're fairly forgiving miniatures to convert or sculpt. 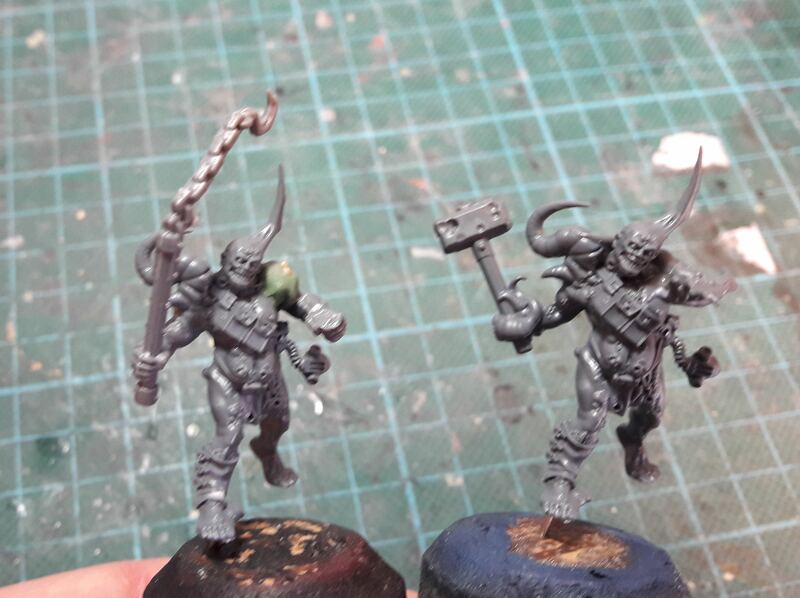 I thought it'd be nice to show my poxwalker conversions. 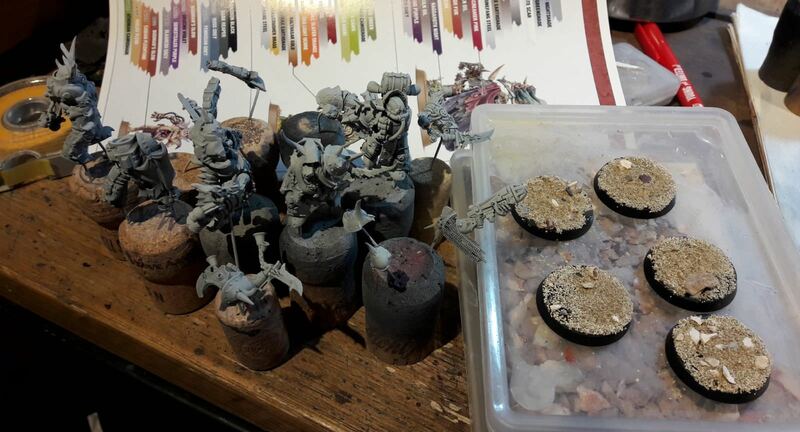 Most of these are arm or headswaps, with some greenstuff or PVA mixed with microbeads to mask sharp edges and transitions. The PVA-microbead mix results in a surface that looks pockmarked and which transitions smoothly into the rest of the miniature. There's also some chaos marauder arms in there. It took me about an hour to convert these. Cheers! I hope you like them and are inspired to convert your own. @ Bjorn FIrewalker: Ha! Those are both posted way back in my thread. If you missed those before, you should definitely go through this thread again! 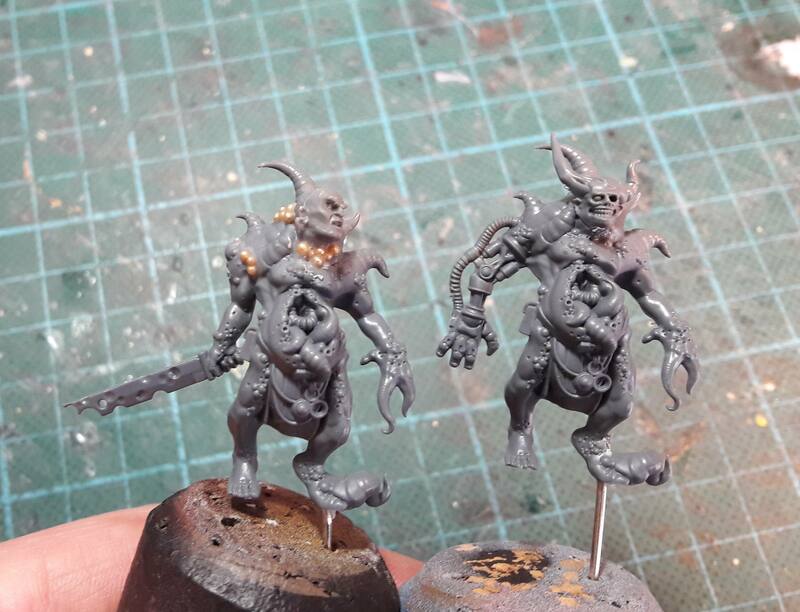 @ Chazzmos: Check out DuskRaiders thread for an excellent rotting flesh tutorial. @ DuskRaider: SO IT BEGINS INDEED Thanks for your inspirational support! @ Eldrick Shadowblade: I'm thinking of the recipe myself, but it will involve both airbrushing and drybrushing. Are those macro.micro beads for extra awesome looking boils and sores? Whatever it is it's awesome looking! 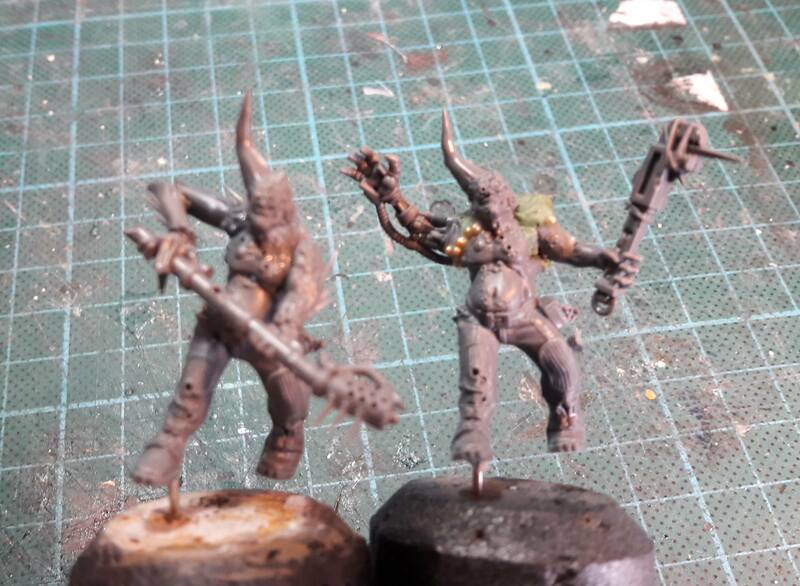 Also, the poxwalker on the right in your first pic, I am naming him Tyrone Biggums. These look great, can't wait to see some paint on them! I've learned to loathe Poxwalkers... good luck, lol.